Researchers from UT Southwestern have gleaned a key cellular mechanism of how the body adjusts glucose levels, an important process that when abnormal can promote diabetes, cancer, and rare genetic diseases. The researchers determined that an enzyme called Protein Kinase C (PKC) can regulate whether more or less glucose should be transported into cells, serving as a kind of thermostat to ensure that proper levels are maintained. The team state that precisely controlling glucose transport is critical to health and added that the process is defective in a variety of diseases including diabetes and cancer. The opensource study is published in the journal Molecular Cell. The team explain that Glucose Transporter Type 1, called GLUT1, transports glucose across the cell membrane of most cells in the body and is especially important in the uptake of glucose by the brain and blood vessels. However, they go on to add that how GLUT1 might quickly adjust the rate of uptake was not fully understood. The current study found that GLUT1 is modified by the addition of a phosphate group by the PKC enzyme. This addition, called phosphorylation, increases the amount of GLUT1 present in the cell membrane and thereby increases the rate of glucose transport. The data findings also showed that the regulation of GLUT1 by PKC was impaired in some patients with a genetic disease called GLUT1 Deficiency Syndrome (G1D). Previous studies show that patients with G1D have seizures, movement disorders, speech disorders, and developmental delays as infants because insufficient glucose is transported to the brain. The team surmise that with their ongoing studies on the regulation of GLUT1 by phosphorylation they hope to identify pathways that may improve the diagnosis and treatment of diseases, including G1D, diabetes, and cancer. The lab are currently focusing on non-melanoma skin cancer, in which GLUT1 is highly expressed. Protein kinase C has been implicated in the phosphorylation of the erythrocyte/brain glucose transporter, GLUT1, without a clear understanding of the site(s) of phosphorylation and the possible effects on glucose transport. Through in vitro kinase assays, mass spectrometry, and phosphospecific antibodies, we identify serine 226 in GLUT1 as a PKC phosphorylation site. Phosphorylation of S226 is required for the rapid increase in glucose uptake and enhanced cell surface localization of GLUT1 induced by the phorbol ester 12-O-tetradecanoyl-phorbol-13-acetate (TPA). Endogenous GLUT1 is phosphorylated on S226 in primary endothelial cells in response to TPA or VEGF. 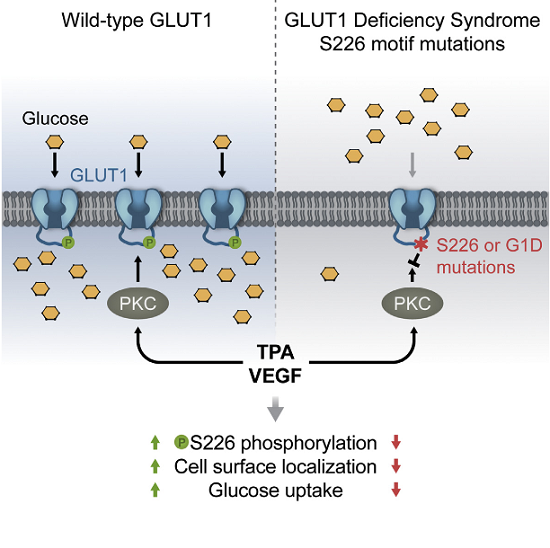 Several naturally occurring, pathogenic mutations that cause GLUT1 deficiency syndrome disrupt this PKC phosphomotif, impair the phosphorylation of S226 in vitro, and block TPA-mediated increases in glucose uptake. We demonstrate that the phosphorylation of GLUT1 on S226 regulates glucose transport and propose that this modification is important in the physiological regulation of glucose transport. A Protein Kinase C Phosphorylation Motif in GLUT1 Affects Glucose Transport and is Mutated in GLUT1 Deficiency Syndrome. Wang et al 2015.